COSACOSA art at large, Inc. creates new public art specific to the concerns of Philadelphia neighborhoods in direct, long-term collaboration with city residents. Through our multidisciplinary art and media projects, COSACOSA reasserts art's original role as a catalyst for community dialogue, creative cooperation, and positive change. We promote parity among people of diverse backgrounds and differing abilities, while building citizen participation in local communities, as well as in society at large. Our focus is on young people living in some of our city's most challenged neighborhoods. We believe that art can change the world. Truly. We envision a society that understands and values the essential need for art in its fundamental, ancient role as a powerful force for gathering, healing, and transforming community. In Philadelphia, individual citizens work together to build a better future for their common community -- our city, our nation, our planet -- outside the boundaries of ability, age, belief, culture, ethnicity, gender identity and sexual orientation. The worth and ability of every individual to contribute to the greater good is affirmed in opportunities for creative expression through the arts. We build trust through clear, forthright professional and interpersonal communication. We act toward others the way we would have others act toward us. We embrace new ideas and continual learning. We exemplify steadfastness and perseverence in achieving our goals. We do more with less. We value collaboration and foster respectful, reciprocal relationships. We share information and resources. We empower each other. We welcome each person's unique gifts and work through each person's unique challenges; we are stronger together than alone. We strive to better ourselves, our communities, and our world. We are responsible for our actions and for each other. 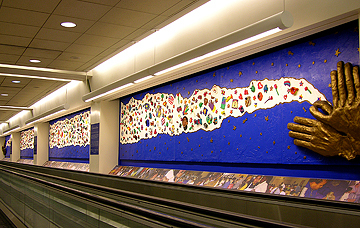 Connection links Philadelphia International Airport terminals with over 1200 child-created ceramic objects exploring "what connects us?" 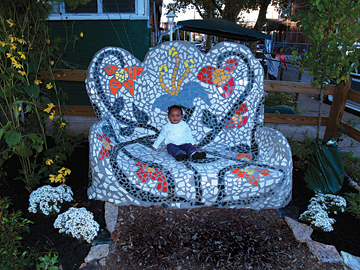 A small friend visits our Healing Garden in North Philadelphia's Nicetown-Tioga neighborhood. 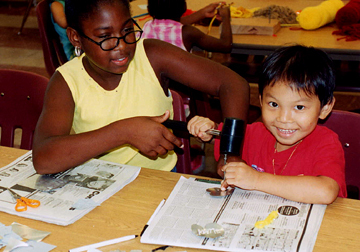 Safe Harbor metal-working partners at the Free Library of Philadelphia create milagros for their hopes and dreams.